So, tomorrow I will be off at the I Do Bridal Show all day...It should be a fun day for all. I know it will be a long day for me...Not used to being gone from home all day! It will be a unique show, not like the normal bridal show. 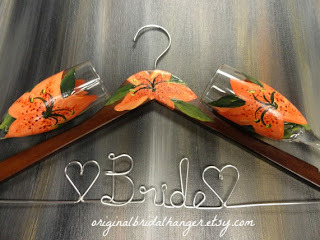 This show is a Artisan Wedding Event...Meaning, lots of handmade items for the wedding day! I will be showing my hangers, and maybe selling a few. 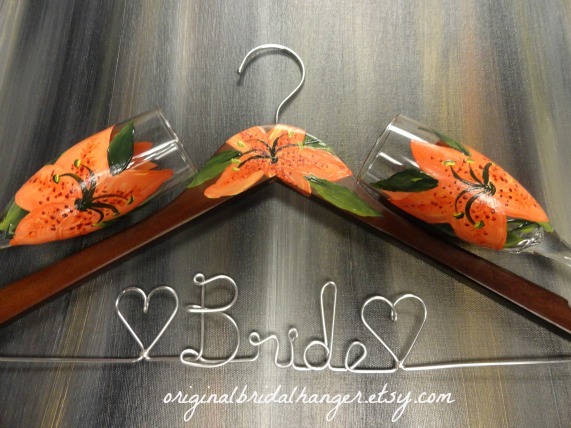 I will also have some hand painted champagne glasses that coordinate with some of the hangers. Some will be for sale while others are just shown as samples. I am hoping some of the generic hangers I am taking will sell. Most of them have coordinating glasses too. It should be an interesting day. I will also have a sample of a few of my pillow designs with me. Cannot wait to see the response to them. Anyway, I hope you all have a great weekend. if you are in Columbus, you might want to stop by the show. It will be from 10 a.m.-7 p.m. The location is Oakhurst is 3232 Norton Road, Grove City, Ohio.... Stop by and say hello!